Yep, you heard me (errr… read… me). I’ve decided that February (which I’ve also apparently decided begins today) is going to be a month for TwT contributors. I want as many contributors as I can arrange, and I want the subject matter to span the world. This is my chance to introduce you to fellow travel bloggers, fellow foodies, friends, and maybe even family (any volunteers?!). However I identify them, they’re all people just like you and me who are writing/reading blogs because it’s fun. Together, we will spice up TwT (at least temporarily) by weaving a web of relatable stories and experiences. Maybe it will trigger your wanderlust, maybe you’ll start salivating, or maybe you’ll just smile. The bottom line: TwT isn’t just about me, it’s also about everyone who’s joining me for the ride. Today, my good friend from college (and one of my favorite Kansans), Molly, has agreed to be the first contributor. I hope you show her a warm, comment-filled welcome and enjoy the different “flavor” she brings to TwT. Today is Sunday. These past few weeks have been quite busy… I’ve worked the past two Saturdays training college mentors and volunteers for both my own job with Jumpstart and as a guest trainer for an organization called Strong Women Strong Girls. These days are fun, a tiny bit stressful, and great at depleting my energy tank. Today I am in the mood for quiet and food. The quiet will be easy, both roommates aren’t home today. Now for the food. 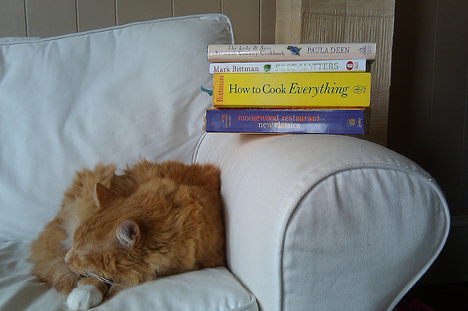 Sunday mornings start with a big cup of black coffee and a stack of cookbooks. Before I tackle the cooking, I need to go to the market. And I can’t go without a list. I can’t make a list until I have a plan. Black coffee is perfect for planning. A colleague recently gave me Mark Bittman’s book Food Matters: A Guide to Conscious Eating and I’ve been thinking a lot about cooking and eating food that is both healthy and sustainable. Bittman makes suggestions that feel very attainable and realistic. I keep that in consideration and think about planning for leftovers (I’ve got another busy week ahead) as I peruse my books and favorite blogs. I don’t love leftovers, and I struggle to figure out what I will still want to eat 3 days in a row. I’ve fallen into the habit of baking on Sundays. I have an office that would happily snack on fresh baked goods but all baked goods I make never seem to make it out of the apartment. Hmmm… back to the list. 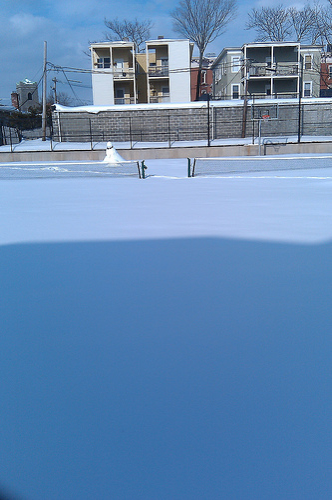 On my way home from the market, I snap a picture of this tennis court covered in snow. Clearly it’s time to get back home. Snowy Tennis Court. Photo by Molly. So once my groceries and I reach the kitchen, it’s time to get started. I tackle Paula Dean’s Savannah Red Rice recipe first (I used her book, but you can find it here: http://www.smithfield.com/recipes/recipe/savannah-red-rice). Paula’s not known for sustainable or healthy recipes. I put a lot of her recipes in my “Farm Food” category…. those are foods you would eat in Kansas but rarely in yuppie Jamaica Plain, MA. But it is cold outside and I know I’ll be grumpy if I don’t have at least one “stick to your ribs” option. The fact that Savannah Red Rice doesn’t call for cream of mushroom soup makes me feel a little better. Savannah Red Rice. Photo by Molly. 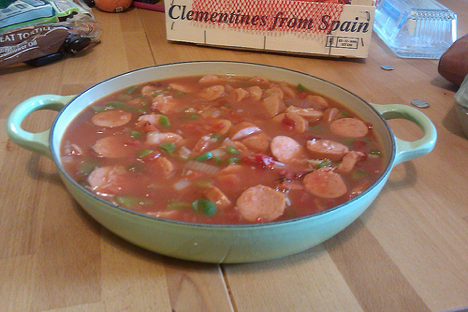 Once that’s in the oven, I wipe off the cutting board and get started on the chili. 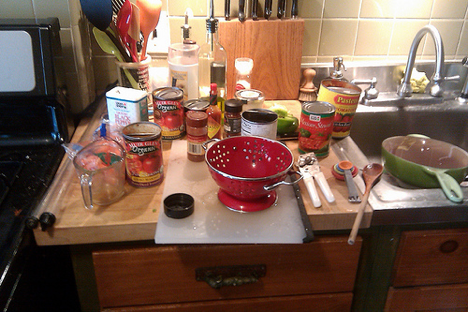 This time I’ll do better at sticking to Bittman’s teachings so I select Deb’s Three-Bean Chili on Smitten Kitchen. I love love love beans, this will be great. I decided to throw in carrots and green peppers. The first time I made chili with carrots, I thought it was going to be weird. But I actually liked it. I think it adds nice color. The green peppers are a different story. Red peppers are far superior to green but today I talked myself into buying the green because they are half the price. I keep telling myself that green peppers add nice color too. 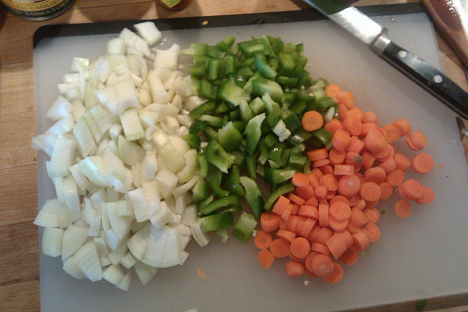 Onions, peppers, carrots. Photo by Molly. I see a lot of recipes that call for Chipotle in Adobo. I am not quite sure what brand these cooks are using. My local grocery cooperative carries a brand that burns so badly I am convinced my face will look deformed if I eat any more. It’s really that spicy. And I like spicy food. I’m skirting around this ingredient by adding roasted diced tomatoes with adobo and some chipotle seasoning. Crisis averted. As I am reading the recipe, I see something about broth. I can do better. I look around the kitchen, and it hits me. 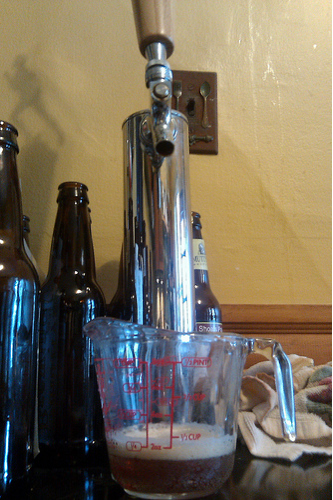 My roommate brews beer and he has his brew on tap in the apartment. Up next: the secret ingredient. 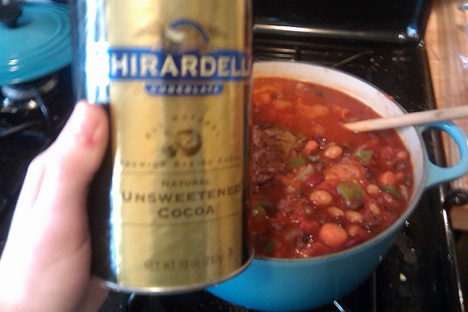 I feel badass adding beer AND cocoa to chili. Cocoa... and Dinner. Photo by Molly. Just simmering the chili for a while. I’ll taste it, but really this is for dinner. Rice and chili are ready. Yum! Leftover potential=Through the roof! Earlier this week, my roommate brought home Red Velvet cookies. They’re addictive. 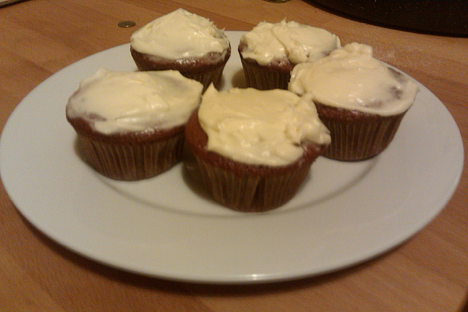 As I was perusing cooking blogs, I remembered that Ali posted a recipe for Red Velvet Cupcakes on her blog Alexandra’s Kitchen. Ali is my friend Katy’s friend and I met her while I was in California last spring. I’ve tried several of her recipes and they are all awesome. I have high expectations for these cupcakes. I rarely stray from recipes in the baking department and I’m following this one exactly, except I’m using a bit less red food coloring. For some reason, food coloring scares me. The staining potential is just too much. 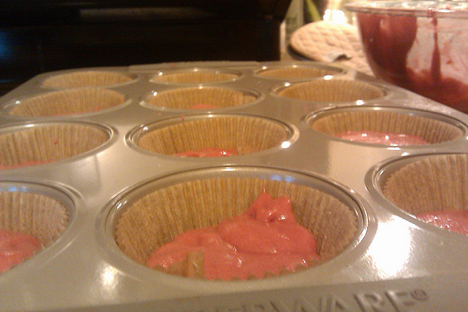 Makin' Red Velvet Cupcakes. Photo by Molly. Red Velvet Cupcakes. Photo by Molly. As I read the ingredients for the frosting, I notice that I’m supposed to use two sticks of butter and 2 cups of powdered sugar. I know Julia Child would be disappointed in me, but I just can’t bring myself to do it. I used a little more than half of what the recipe says. 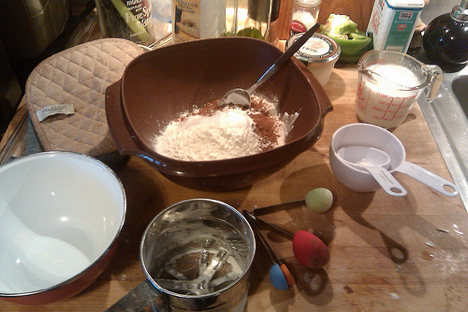 The result–frosting is very cream cheesey but still good. Red Velvet Success. Photo by Molly. I’ve just surveyed the damage. I have just made enough food to feed 6 people and I’m the only one at home. Molly lives in Boston and works in the non-profit world. She loves to run, cook, and tap dance. Sebago Lake is her favorite place to visit. You can follow her on Twitter for more kitchen adventures in Jamaica Plain at @molstherunner. That cat is so cute. I want one. Nice picture too. Isn’t he cute?! Purrr…. Technically it’s her roommates’ cat, but as long as he poses all cute in photos who ares? Hooray! I love the MJ guest post 🙂 Now I just have to find a way to get across town, sneak into her apartment, (outsmart her apartment’s new alarm system), and get one of those cupcakes into my mouth. Challenge accepted. Yay! You’re next… Maybe a little something about becoming an acupuncturist in Boston?! 😉 Save me a cupcake though!! Thanks for sharing your experience with us…………… really nice post and u had a lots of experience on travel tips………..
Nice post 🙂 All this talk of food and running – I am now having food guilt about the pub lunch and Kit Kat that I have just polished off. Gym tonight! Ha. Never have food guilt. Eat WELL, run HARD. Both are equally delicious to do. The end. That was so much fun to read, Molly! Thanks! Thanks! And thanks for the opportunity Tavle! For the record, Casco the cat did try the cupcakes. He said they were delicious. It was my pleasure! Thank you for being a part of TwT… and with so little warning! Come back anytime. 😀 The people LOVE ya!